Location: South side of Moss Bank Road on what is now Scafell Road. Notes: Moss Bank station was situated on the St Helens Canal & Railway Company’s (SHC&RC) St Helens – Rainford Junction line which opened on 1 February 1858. The line was in effect a 6-mile 7 chain northern extension of the SHC&RC Widnes – St Helens line that had opened as the St Helens & Runcorn Gap Railway on 1 February 1833. The SHC&RC obtained an Act to build the line on 4 August 1853 and had the support of the East Lancashire Railway (ELR) who agreed to build a line from Rainford to Ormskirk with the aim of ultimately reaching the seaside town of Southport. At Rainford Junction both the SHC&RC and the ELR lines connected with the Lancashire & Yorkshire Railway (LYR) Liverpool and Wigan line. The ELR line opened from Rainford Junction to Ormskirk on 1 March 1858 and was never extended towards Southport. Moss Bank opened with two other stations on the line (Gerrards Bridge and Rainford) on the 3 March 1858. The LYR opened a new station called Rainford Junction on its line (replacing its original Rainford station which had been further west). The station was located on the south side of a level crossing which carried Moss Bank Road over the line. It served the small settlement of Moss bank which lay a short distance to the north-east. At the time of opening the line was single track railway and a platform was provided on the west side. It was constructed from stone and on it stood a simple timber building. 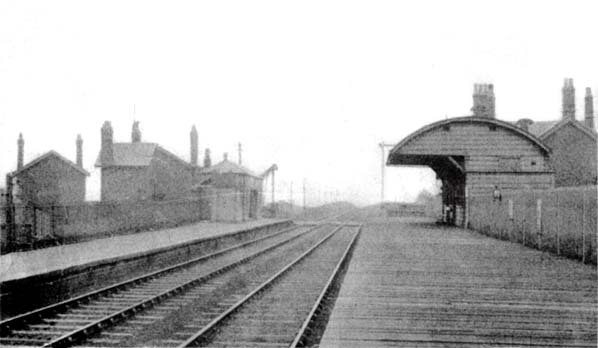 Passenger services ran between St Helens and Rainford Junction and at the time of opening there were four trains in each direction on weekdays. 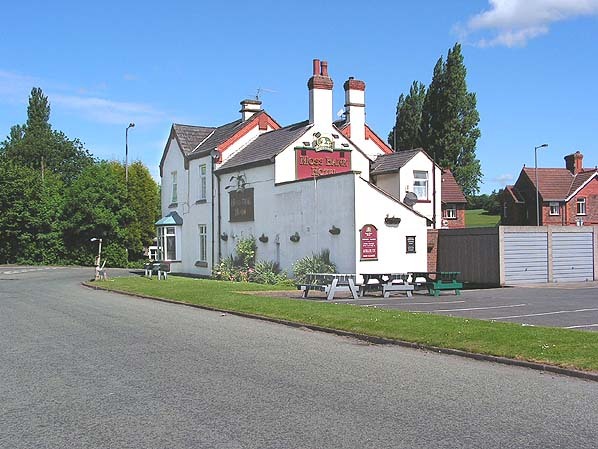 Passengers could connect with ELR services to Ormskirk and with LYR services to Liverpool or Bolton at Rainford Junction. The line was always more important for freight services and it carried large volumes of goods from the start. On 13 May 1859 the ELR was absorbed into the LYR. On 1 June 1864 the SHC&RC was taken over by the London & North Western Railway (LNWR) but the LYR maintained its running rights over the line between Rainford Junction and St Helens. An open lever frame was installed at Moss Bank station by 1880. It was located at the north end of the platform close to level crossing. By this time sidings had also been added on the east side of the line and the Railway Inn had been built adjacent to the station also on the east side of the line. In 1890 the line was doubled. The original line became the up (Rainford direction) and the new line the down (St Helens direction). A timber platform was provided for the down line. New facilities were provided on the down platform. They included a new booking office and waiting rooms housed in a timber building with a distinctive curved roof. The December 1895 timetable timetable showed Moss Bank as having 7 up and 8 down services Monday-to-Friday. There were 2 extra up and 1 extra down trains on saturdays and 3 trains in each direction on Sundays. By 1909 the service had increased to 12 trains each way on weekdays with three on Sunday. This increased to 14 by 1914 but had dropped back to 12 by 1915. There were some alterations to the numbers and timings of trains on Saturday. The Sunday service remained at three trains. In 1911 the LNWR revamped the services on its line. The LYR had introduced Hughes rail-motors complete with trailer carriages in 1907 on its half of the line from Rainford Junction to Ormskirk. The LNWR had similar plans, but at the last minute, decided to introduce motor trains using small 2-4-2T tank engines; their 4ft 6in driving wheels were fitted with mechanical operating gear that enabled engine’s regulator to be operated from the driving cab of the coach by means of a rod running beneath it. New coaches were specifically constructed for this service in 1911. By 1920, through services were operated by both companies, with three trains a day from each company making the through journey out of a total of 12. The Sunday service had been discontinued by 1920. On 1 January 1923 the entire route from St Helens to Ormskirk became part of the London Midland & Scottish Railway (LMS) which brought it under the direction of one company for the first time. The LMS withdrew the original 4ft 6in driving wheel 2-4-2T engines in favour of the 5ft 6in driving wheel version of the 2-4-2T, and the motor train operation was by the LMS vacuum system. The coaches were also replaced with other LNWR coaches converted to use the vacuum system. The same types of engines and coaches were then used until the service was withdrawn. The 1932 LMS summer timetable showed 15 up and 15 down services Monday-to-Friday. There was an extra down and 2 extra up trains on Saturdays but there were no Sunday trains. During the Second World War passenger services were reduced and they never recovered to their pre-war levels. The LMS summer timetable for 1947 showed eight trains in each direction on Monday-to-Friday as shown in the table below. On Saturday there were three extra trains in each direction. Seven of the weekday down trains had connected with Ormskirk services. 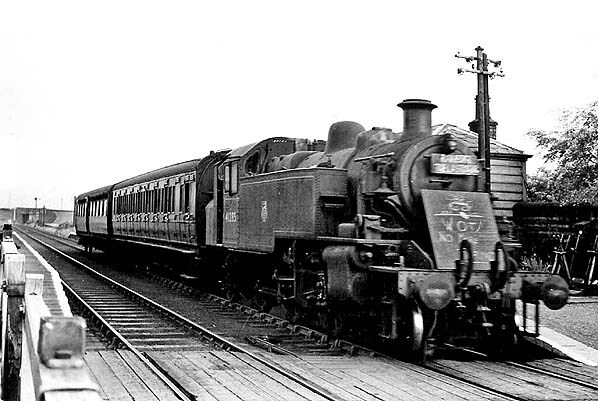 In 1951 BR(LMR) proposed the withdrawal of the St Helens and Rainford Junction service and, despite local opposition, the last trains ran on Saturday 16 June 1951. The wooden up platform and associated buildings were demolished in 1956. Sometime after 1957 the lever frame was moved to the down side of the line and it is likely that the up platform was demolished at that time. Goods trains, always more numerous than passenger services, continued to pass through as did some passenger diversions and excursions. Even in 1964 the line had two daily pick up goods services calling at Old Mill Lane sidings, with one continuing on to Rainford Junction, and there were five through freight trains running to/from the north-east. On 6 July 1964 the section of line between Rookery and Rainford Junction was taken out of use, however the track and signals remained in place and this section of line was officially mothballed. Trains continued to run through Moss Bank to serve a sand washing plant a mile to the north. The plant remained rail-served until 1 January 1967 when the line was cut back to Pilkington Sidings. The track and signals that had remained in place between July 1964 and January 1967 were removed shortly after. Moss Bank station looking north-west from the down platform. Moss Bank station shown on a six-inch scale map from 1858. The map shows the station during the period when the route was a single track railway. A six-inch scale map from 1890 showing the line after it had been doubled. A hotel had opened next to the station and sidings had been installed. 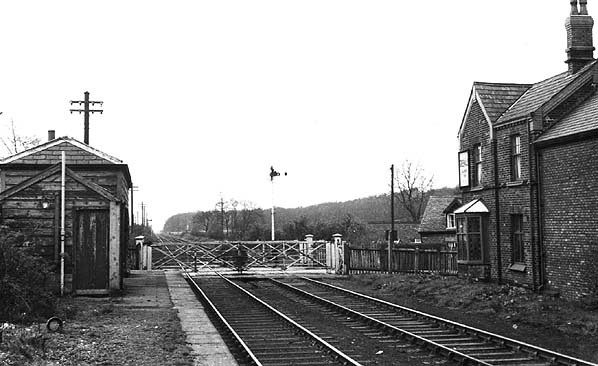 Looking south-east at Moss Bank station on 16 June 1951. A Rainford Junction train is seen departing from the station. This was the last day of service and railway staff have marked the occasion by putting unofficial headboards on the locomotive. Moss Bank station seen looking north-west from the up platform in 1957. The down platform had been demolished by this time. The site of the Moss Bank station looking north in May 2005. 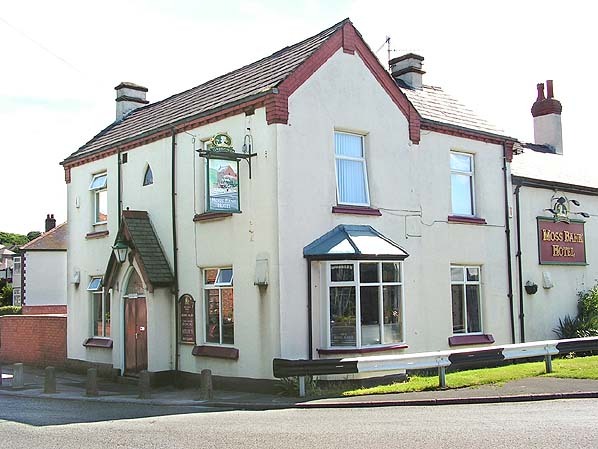 The station was alongside the inn. Moss Bank station was to the right of the Inn seen in this May 2005 view looking south-east.